Did you know that you can schedule a personalized soup-to-nuts visit to Zappos headquarters in Henderson, NV, outside of Las Vegas? 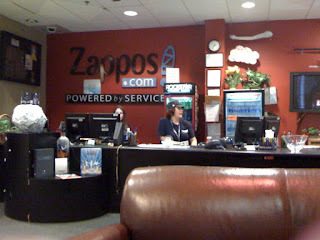 I did just that this past February while at Surfaces to experience for myself the Zappos service mystique. Zappos' tagline, after all, is "powered by service"; the company is committed to delivering consistent 'wow' service. How does 'wow' service manifest itself within a corporate environment? I wanted to know. 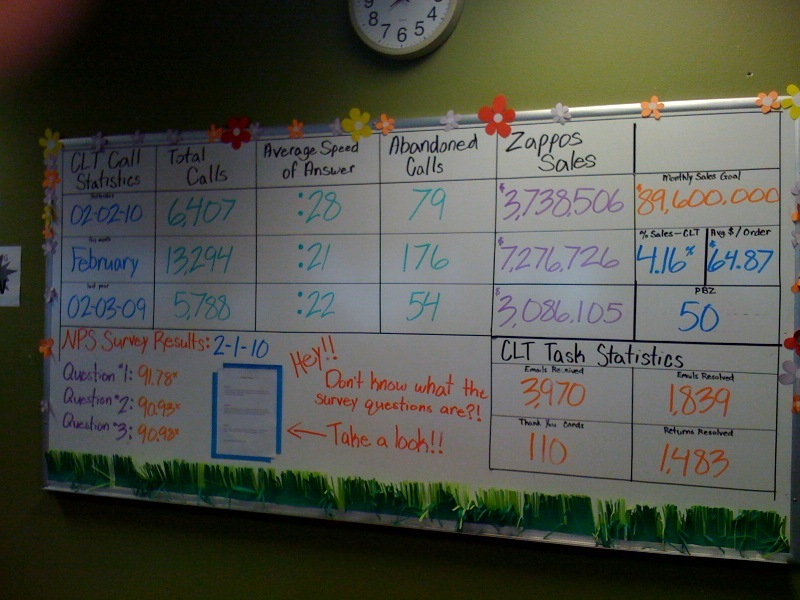 My visit to Zappos led to my Floor Covering Weekly column titled "Powered by service" in the February 25, 2010 issue. Did you see it? What were your reactions? 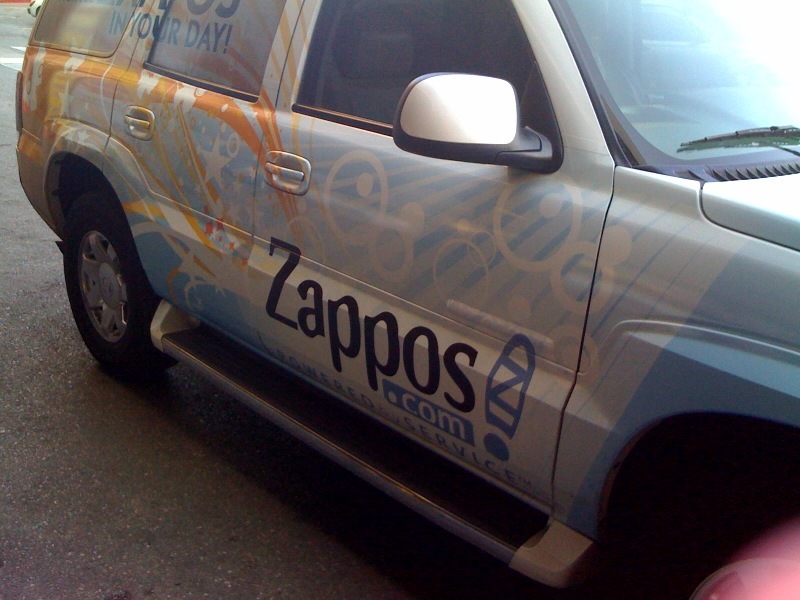 I've been accumulating stories about Zappos for several years. The company first caught my attention when I shopped online for a leather handbag - something I had never done. This must have been 2005 or so. I wish I could remember the exact details of Zappos awareness. I think I heard a woman at the gym talking about ordering shoes online from a company with an amazing 365 day return policy, free shipping and free returns. I may have gone to the site on a whim [I love shoes], then gotten more interested when I saw handbags worth exploring. Despite a level of discomfort with not being able to touch/feel the bag, I took the risk willingly because of the return policy. Note the lesson: Zappos eliminates the biggest hurdle to online shopping - not being able to feel/touch/try product - via a generous return policy. In so doing, it makes shopping online as convenient [possibly even moreso] than through traditional channels. Opportunity: how can you transform your retail experience to be more convenient for your customers? Can you imagine inviting your customers - and potential ones - into your administrative environment to witness the inner workings of your sanctum and see the true you? It's not for the faint of heart. And, yet, Zappos does so routinely. Simply fill out an online form to get the process going! My online request led to an email exchange which culminated in several cell phone exchanges the day and ten minutes before the scheduled pickup time. A Zappos car -pictured above- picked me up at the Sands Convention Center [Thank you, Zack!]. I spent a few minutes in the Zappos reception area where I observed employees, vendors and visitors interacting. A recent employee practiced giving her own tour to a Zappos veteran. The reception area doubled up as a concierge desk for employees to handle travel arrangements and dry cleaning. 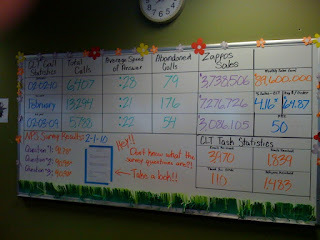 Many of the articles I've saved discuss how fun Zappos is to work for. I witnessed a celebration of individuality and creative expression, but also saw the fanatic focus on customer funneled through structured measurement so it leads to productive results. Take a look at the chart below which visibly tracks critical measures. What do you measure religiously? Do you make all of these data points visible? Do you encourage a collaborative and creative approach to improving results? Consider this article by Jeanne Bliss titled Earning Customer Raves: make These Five Decisions, and Customers Will Grow Your Business for You. Zappos immediately came to mind when I read it. For each of the five decisions, the Zappos answer is surely Yes! 1. Do you trust your customers? Do you trust your employees? 2. Do you make decisions with clarity of purpose? 4. Are you there for your customers? 5. Do you act with humility when you make a mistake? When the answer is yes, you can expect customers to willingly and enthusiastically tell your story. As do Zappos' customers. Zappos' culture is unique; it goes deep, too. "On average, the survey found that Americans are willing to spend approximately 9.7% more for great customer service. The survey, however, paid particular attention to the way in which great service impacts the buying decisions of online consumers. It was concluded that consumers in the online retail category are willing to pay an even higher premium for great service (10.7%) than they would in most other categories..."
Customer service according to the article is a function of content, shopping and delivery, and customer support - areas that Zappos addresses enthusiastically, proactively and creatively. I'll be exploring more of these points over several posts. With Spring officially in place, I sense an opportunity to conduct a retail reality check on your customer experience. In the June 2009 issue of DDI Magazine, two articles caught my attention: Choreographing the complete brand experience and 5 ways to build a positive in-store customer experience. Unfortunately, I can't find links to them so you'll have to rely on my interpretation. 1. Auditing your business: what differentiates you, who are your customers, what do you sell and are all of your elements aligned? 2. Examining your competition: how much do you overlap? 3. Objectively reviewing your store environment: does it communicate all that you identified in your audit? 4. Testing, obtaining feedback, implementing and retesting in a continuous feedback loop that connects you with your customers. 2. Tailor messages so they connect with what is meaningful to your core audience. 3. Make sure that you place signage where it makes most sense for your customers [can they see it?]. 4. Create custom visual designs to better engage customers. Making customer experience a priority. Listening to customers not just via social media channels, but also traditional ones. Ensuring that your brand stands for something real. Understanding that customer experience affects customer loyalty, which in turn influences profitability. There is a clear definition of target customers. The needs of target customers are well understood. There are clear objectives for how the project will impact target customers. The experience is designed for every stage of the customer lifecycle, from initial roll-out to ongoing support. There is a plan for testing the impact on target customers. There are resources and time allotted to iterating on the design to improve customer experience. There is a plan for gathering ongoing feedback to monitor the customer experience over time. There is a clear definition of success, for both the company and for target customers. Yes, there are similarities in these lists. I find though, that multiple takes on a similar topic help me internalize better what I need to do. Is is the same for you? How do you go about doing a customer experience retail reality check? Meet the needs of your most demanding customers - i.e., women - and you can be assured that you will also delight the rest of your customer base. In other words, win-win retail experience, right? That's what Best Buy discovered as detailed in Best Buy, Minneapolis, Equal Opportunity from VMSD 11/2008. Per the article, "Best Buy research found that the female audience influences 89% of all technology purchases." The company started to pay attention to what women customers and employees shared about the retail experience and the result was a complete store redesign. Best Buy discovered a total win-win retail experience. Yes, that's electronics. But, it's just as relevant to flooring and other categories. So, how might you transform your retail experience into win-win? Meet Matt Selbie. Matt is passionate about customer opinions, which is why he formed Oberon3 and developed Opiniator to obtain feedback from customers and convert that feedback into actionable insight to improve the customer experience and help diminish customer defection. Matt contacted me after reading Scott Perron's post about Big Bob's Customer Comment Cards. What resulted was an intense conversation about customer opinions and their value to businesses - particularly those committed to improving the customer experience. I realized that many of Matt's experiences in the oil business echoed mine in the fibers business [i.e, think how to differentiate commodities]. Differentiation means creating a memorable experience for customers; experience truly is everything, but you must monitor it and ensure it remains memorable and differentiated. Consider this chart from a Gartner 2008 study about improving the customer experience. 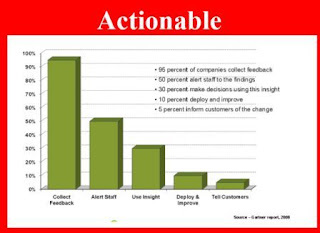 It illustrates a critical point: although many companies [i.e., 95%] collect customer feedback, very few actually do anything with the data. Imagine if more could be done with that feedback, particularly if it were obtained at the very moment that customers experienced the service, and if it could become the basis for continuous improvement, for building customer relationships, for increasing loyalty and for generating more word-of-mouth referrals. I invited Matt to talk more about the customer experience, using Opiniator to illustrate the value associated with not only obtaining customer feedback, but also in figuring out what to do with the data to improve your customer experience. I spent most of my career in the energy business working in various oil companies in Europe, South America, Asia and the US. Most of the assignments were in strategy, general management or marketing roles. C.B. : How did you become so interested in customer feedback and the customer experience? Gasoline is seen generally as a commodity hence the customer experience can be a huge differentiator. My team did a lot of work in understanding defection rates and the impact and economics of good and bad experience. Most customers DON'T complain, they simply walk away never to return, but may well now use social media to tell many others how bad their experience was - so you are not only losing a customer and revenue source but gaining negative word of mouth. C.B. : This is where Opiniator comes in, right? So, what is Opiniator? Opiniator is a business improvement system that allows any business to receive user feedback in real time about a product or service via the user’s own mobile phone. Brief questions are asked at the point of experience or consumption, and the user responds with a score, opinion or suggestion. Users love it because they always get their views seen and their opinions reviewed. Businesses love it because they receive real time, actionable feedback on the issues that really matter – those driven by real customers. This means they know which things to fix and how urgently they need fixing. This keeps customers happy and prevents them defecting. Opiniator is a web service which means there is no hardware to buy, or software to deploy, it simply uses mobile phones and the web which means easy to use and cost effective. It is software as a service (SaaS). The business only needs an internet connection to view the data and analytics. Opiniator is also a self service model which means the business can set their own questions and targets, however often they want. C.B. : Who is the ideal Opiniator user? Any business that needs to really understand the users of its product or service and act on their feedback. This means we now have Opiniator being used within the energy sector, restaurants, bars, coffee shops, retail, advertising agencies, research agencies, pest control, cleaning, home and office repair, auto dealers, conferences and training. It's valuable for businesses that depend on subcontractors - who often may be the last point of contact with a consumer. C.B. : How does it work? From research and experience, we know that point of experience feedback is always more plentiful and accurate on site than post experience surveys, so Opiniator asks questions on site whilst the product or service is being consumed or experienced. The customer answers via any cell phone, any carrier, and may be rewarded instantly as an incentive. If customers prefer to respond via web, they can do so easily. Same goes for using a traditional mail-in postcard, although that feedback won't be instantaneously available until the postcard is received and the data entered. Note the survey can also be anonymous, which also encourages participation. C.B. : What can business owners do with the information? The data is analyzed in real time and available via the web to the business so they can see what the issues are and what needs to be fixed in prioritized order. The business can use the data to improve operational issues, to supplement or replace other survey techniques and of course to answer more strategic questions [e.g., who is my competition, what is the right price, how can I best compete]. As the data is presented graphically, Opiniator also is widely used for staff training. C.B. : Matt, why should business owners care? All businesses have customers who defect. This defection rate is usually much higher than business owners think and hence a much bigger problem. This robs the business of cash now and in the future, means more needs to be spent on acquiring more customers and of course means the defecting customer may bad mouth the business. Hence it is always more profitable to retain a customer base than it is to acquire a new one. The only way to prevent defection is to be close to customers, understand what they want and how the business is performing relative to their needs and take quick action. Opiniator allows customers to provide their feedback, when it matters at the point of experience, and hence delivers a business improvement tool to prevent defection. C.B. : How does this differ from sites like Yelp or Twitter or social search? Social media tools are largely aimed at peers or the general public, and is delivered more as a commentary. This makes it very hard for the business to systematically understand what is being said and what business decision should be taken to improve. Structured feedback with actionable analytics from the customer aimed at the business allows resources to be applied to the right issue at the right time and takes away the subjectivity. C.B. : What suggestions do you have for improving the retail experience for customers? Listen to your customer, ask the right question, ask often and deliver the appropriate change. Use customers as your quality control device, your shopper panel and your mystery shopper and ensure you take action on what they are saying. I'd love to hear your take on this subject. How do you obtain feedback form customers? And, then, what do you do with the information you receive? Imagine if you could obtain real-time feedback from customers. How would it change what you do with the feedback? How would you improve your customer experience? Arthur Corbin, retail and lighting wizard, shared the following comments during an online chat in response to my post about Stores Within Stores Give Me Something To Talk About. 6:04 AM Macy's had the store-within-the-store concept in the late 1970s and 1980s. A budget was available for store concepts that associates proposed. Floor space and stock was provided and if the concept was successful, more space and more resources were made available. The Cellar, a nationwide Macy's department, was one of the results of this creative period in Macy's evolution. 6:06 AM The classic store-within-the-store is the shoe department. This department was contracted out by the major department stores beginning in the early 1900's. Another is cosmetics. Cosmetics can generate 50% of a store's profit so cosmetics is usually on the ground floor. Most of the expenses and stock of cosmetics departments are paid for by the manufacturers and department stores have little or no dollars in these departments. 6:08 AM Flooring companies need to think of their home owner customer that is remodeling and what other goods that customer might be looking for. Consider Miele appliances, Whirlpool laundry equipment, furniture, electronics, and soft goods as some possibilities. You can meet the sales managers of these companies at trade shows. Prepare a company vitae to show the sales managers what strengths your company has in your market, include customer testimonials. Remember, major companies are actively looking for ways to reach homeowners who are remodeling Trusted retailers can leverage their customer relationships, these relationships have value that extends over decades. 6:10 AM Visit ABC home in New York or a local artists co-operative or a farmers market for more examples of cross-selling opportunities. What regional goods need more exposure? What regional foods would bring people in to a special event? 6:11 AM Use your parking lot, set up a tent, and have a meet the neighbors event. include a few non-profits. Store owners will find their brand can be extended to new categories of goods. Ask an interior designer to give a 45 minute talk about home trends, serve great food and drink, and prepare a world class handout. Include your company history (see www.blancboutique.com and www.abchome.com for examples), the services and products you offer (the magic words are,"our companies history, experience, and selection save you time & money. "), and customer testimonials. Add an offer, "buy the flooring, get a thank you gift." Emphasize that you are a locally based, family owned business. Remember to market to different ethnic groups, be sure your sales people speak other languages, particularly Spanish. Many ethnic groups are looking to buy the best available quality and family members will pool their monies to enable one family member to make the better purchase. 6:13 AM Finally, use the Internet. Partner with an Internet site and have goods delivered to your store for pick up. Set up a comfortable internet order kiosk in a quiet part of your store to give your customers another reason to visit between remodels. 6:15 AM Retail is a verb. Getting by and doing what has always worked is not going to create sales in the next decade. We are all going to be working harder and putting in longer hours for the next few years as our financial system redefines itself. Ask your manufacturer's for help, ideas, and co-op dollars, they have lots of experience and resources. Retail customers are looking for unique and enjoyable retail experiences, look at the success of Anthropologie. Our customers have become more selective about what stores they will visit and more selective about what stores will get their hard earned dollars. 6:17 AM me: Keep up the writing about change and retail excitement. Most flooring stores are tepid at best. 6:28 AM Christine: Arthur, I really appreciate your feedback. 6:30 AM Meant to add - you reminded me of the magical Bloomingdales' yearly Fall events where different countries were celebrated thruout the store in NYC for a month? or so. Talk about creating a reason for people to go back to the stores to experience a one of a kind event that was entertainment, education and inspiration. Macy's San Francisco does the Easter Flower Show that is also magical. Some of the begonias have been in each show for over 30 years. Macy's also does the Fashion show in SF and NY that benefits AIDS non-profits. The fashion shows are contracted out and usually sell out 2 shows. GM had a series of vehicles called the Futureliners that toured the US in the 1930s and 1940s and showcased technology, science, and GM as an innovator. Something like that is needed for consumer goods to build excitement and to create demand. Thank you, Arthur, for sharing these wonderful examples of retail cross-selling ideas. What other examples have you come across that effectively cross-sell and draw customers into stores? Meet Troy Aeby, Duralum Carpets Inc.
Meet Troy Aeby. He is president of Duralum Carpets Inc., located in Stevens Point, Wisconsin, and has been busy repositioning his business to better connect with customers. Not only has he been modifying his in-store retail experience to make it more engaging for women customers, but he has also established a stronger online presence via an updated website and through participation in social media. More specifically, Duralum Carpets can be found on Facebook, as well as on Twitter, and Troy launched the Duralum Carpets Blog on October 27, 2009. Troy has been a faithful subscriber and commenter to this blog. I recently caught up with Troy and asked him a few questions. C.B. : Troy, tell me about yourself and your company. 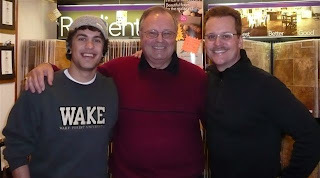 I own and operate Duralum Carpets Inc, a 3rd generation [see photo above with all 3 generations: from left to right, Lance Aeby (my son), James Aeby (my dad) and Troy Aeby (me)] floorcovering retail business since 1962 in Stevens Point, WI. We provide both full service (materials & professional installation) and cash & carry. Our product selection includes: Carpeting (residential & commercial), Hardwood flooring, Ceramic & Glass tiles, Cork flooring, Bamboo flooring, Laminate flooring, Carpet & Vinyl remnants, Vinyl flooring, and Area Rugs. C.B. : How did you get involved in flooring? I remember many times at the kitchen table my dad would talk about his day and the various aspects of the floorcovering business. I got a lot of training at that table that I found would really come in handy later in my life... little did I know it at the time. The great thing about my dad was that he encouraged me to be in the business but never made me feel that I had to do it if it was not right for me. I was introduced to floorcovering professionals who further aided my knowledge of how a successful business should be run. My main focus now is to apply the best of the past with the best of the present. C.B. : So, how did you get involved in social media? We have made some major changes to our website thanks to John Simonson of Webstream Dynamics. He has been a trusted vendor for many years and when we spoke of upgrading websites, adding a blog, Facebook etc., he mentioned your name as someone who has a great grasp of social media and how it can help any business. I checked your blog out and really liked the way you present the rather complex issue of social media in an understandable way. Your views on looking at your business presentation from a female perspective have really helped. We currently interact via social media in a variety of ways: Facebook updates via pictures and videos, our weekly blog that deals with a variety of topics, our website that combines various media forms and also serves as a link to our Facebook Fan page and Blog, and just recently I have gotten involved with LinkedIn for business contacts. C.B. : What have you found most effective? Currently our website and Facebook presence have yielded the most response. I truly love working with customers and the social media aspects of the floorcovering business. I would have to say that the managerial aspect of business payroll, taxes and the like are my least favorite part. Go out and see what others are doing in your industry and other related industries. I make it a point to visit other stores when I'm on vacation to see how others do things. It's amazing when I stop in. I'll introduce myself to the owner and tell them why I'm there. Truly successful people are more than willing to share insights and ideas to those who are truly interested, and because we're not in direct competition, we can help each other out. We have been using the Nov, Dec, Jan months which are typically slower to revamp and retool our showroom and make it more interactive for our clients. We've added a walk in shower, whirlpool and backsplash displays to further enhance the experience. We always try to involve trusted vendors in our showroom and displays. Our new website has been getting a lot more views and has been yielding more home measurement requests. C.B. : What do you like most and least about social media? I like being able to reach persons that I may never have been able to otherwise and give them a view inside my business. On the down side, there is a lot of information overload out there. Currently I manage the social media at Duralum Carpets Inc. I set aside a small amount of time daily to manage social media. Once you get your ground work done, maintenance is easy. Follow sites like yours to get great advice on how to proceed. Follow industry leaders and model their progress. How might you rethink your business and add social elements to better connect with customers? Imagine rewarding volunteers in your community by offering them something free. In the case of Disney Parks, it's free admission for one day. Intriguing, no? Disney announced the program 0n 9/29/2009 in Disney offers free entry to 1 million volunteers. 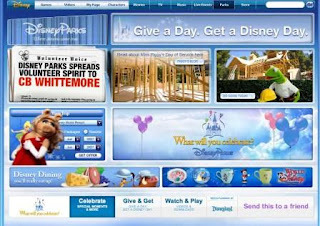 If you follow the links, you will access Disney Parks. Then, Give a Day, Get a Disney Day. From there, you can sign up and search for volunteer projects. For some special fun, you can create your very own personalized Muppet volunteer experience as Becky Carroll did for me! How might you apply the concept of volunteering in your community to your retail experience? While you're thinking, go ahead and have a Disney Parks Volunteer Muppet Experience. More specifically, February 2010's blogposts included Fascinating Marketing Presentations, Social Media Marketing Resources, Simple Fun and Simple Marketing News. From BRITE '09, Jeff Jarvis Discusses Customers in a Googly World. Yes, just plain & simple fun: keeping track of the simple pleasures in life: Simple Pleasures: 2/19 - 2/25/10.